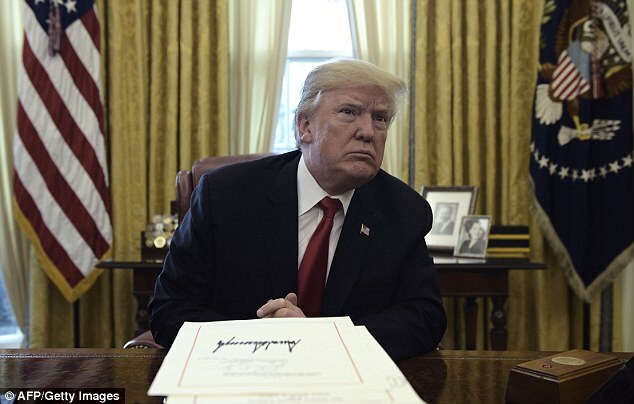 President Donald Trump fired off a warning tweet to North Korea Tuesday night, taunting leader Kim Jong Un who said in his New Year speech that Americans should be aware he has a 'button' for nuclear weapons. Kim warned America that it can 'never start a war against me and our country' and insisted his nukes are now a reality, not a threat. Despite the ongoing war of words, Pyongyang this morning revealed it will reopen a hotline with South Korea to discuss attending the Winter Olympics. The hotline, which was cut by the North in 2016, is to be restored this morning after Seoul proposed high-level talks in response to an olive branch from the North's leader ahead of next month's Pyeongchang Games. The dictator's overtures to the South marked a rare softening in tone, as tensions over its banned weapons programme have surged in recent months following a flurry of missile launches and its most powerful nuclear test yet. Meanwhile the U.S. ambassador to the United Nations, Nikki Haley, warned North Korea on Tuesday against staging another missile test and said Washington would not take any talks between North and South Korea seriously if they did not do something to get Pyongyang to give up its nuclear weapons. Haley told reporters the United States was hearing reports that North Korea might be preparing to fire another missile. 'I hope that doesn't happen. But if it does, we must bring even tougher measures to bear against the North Korean regime,' Haley said. A U.S. official, who spoke on condition of anonymity, said there were indications that could point towards a potential missile launch 'sooner rather than later,' but cautioned that such signs had been seen in the past and no test had resulted. 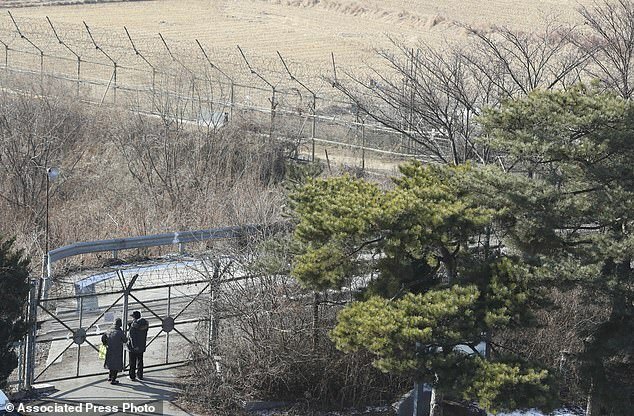 North Korea announced it would reopen a long-closed border hotline with South Korea on Wednesday. 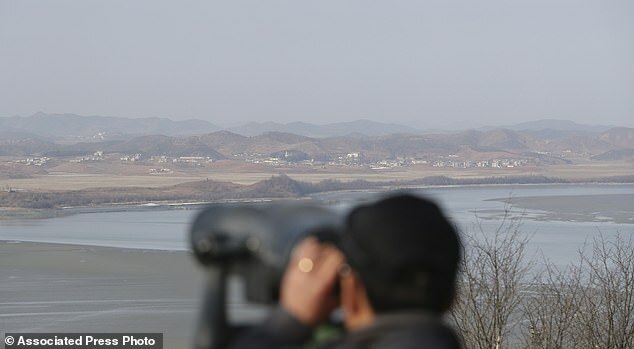 The North's unscheduled statement, read out on state television, came a day after Seoul proposed high-level discussions amid a tense stand-off over North Korea's missile and nuclear programmes. That followed Kim's New Year's address, in which he said he was open to speaking with Seoul and would consider sending a delegation to the Winter Olympics to be held just across the border in Pyeongchang in February. Kim gave the order to reopen the border hotline at the truce village of Panmunjom at 0630 GMT (1.30am ET) on Wednesday, said North Korean official Ri Son Gwon. The hotline with the South was shut down by North Korea in February 2016 in retaliation against the closing of Kaesong, a border factory town that was jointly operated by the two Koreas. 'Detailed orders were given regarding setting up working measures with the South Korean government that should be taken up with a serious and sincere stance,' said Ri, chairman of North Korea's Committee for the Peaceful Reunification of the Fatherland, which deals with issues relating to South Korea. The talks would aim to establish formal dialogue about sending a North Korean delegation to the Pyeongchang Winter Olympics, Ri said. An official from South Korea's unification ministry told Reuters they were ready to speak with North Korean officials once the hotline was opened. Government officials check the hotline, a telephone line at the border, twice every day in the morning and afternoon. South Korean presidential spokesman Yoon Young-chan said North Korea's decision to open the hotline had 'significant meaning' because it could lead to constant communication between the two Koreas. 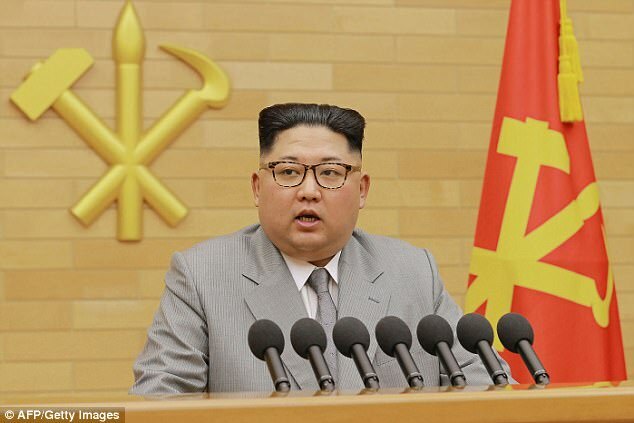 While appearing to open the door to discussing taking part in the Winter Olympics - which would be the first direct negotiations in more than two years - Kim also sternly warned that he would push ahead with 'mass producing' nuclear warheads in defiance of U.N. sanctions. Trump, who has led a global drive to pressure North Korea through sanctions to give up development of nuclear-tipped missiles capable of hitting the United States, earlier held back judgment on Pyongyang's offer to talk, saying on Twitter: 'Rocket man now wants to talk to South Korea for first time. Trump has frequently derided Kim as 'rocket man.' The U.S. president said sanctions and other pressures were starting to have a big impact on North Korea. Kim and Trump have exchanged fiery barbs in the last year and the U.S. president has warned that the United States would have no choice but to 'totally destroy' North Korea if forced to defend itself or its allies. 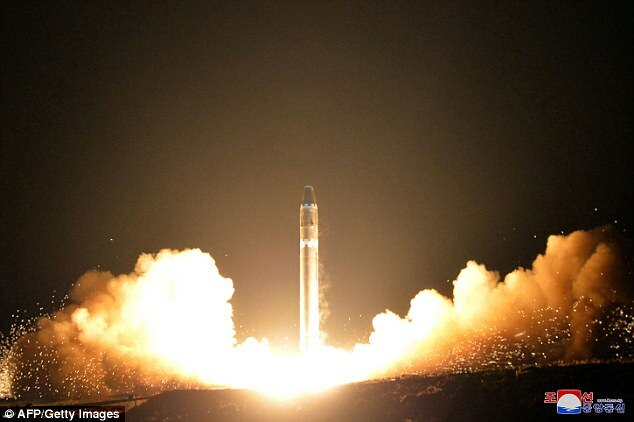 North Korea regularly threatens to destroy the United States, South Korea and Japan and tested its most powerful intercontinental ballistic missile in November, which it said was capable of delivering a warhead anywhere in the United States. South Korea's Unification Minister Cho Myong-gyon said the offer for high-level talks next Tuesday had been discussed with the United States. Nauert said she was not aware if the matter had been discussed in advance of the South Korean response. Cho suggested the talks be held at the border village of Panmunjom and said they should be focused on North Korea's participation at the Olympics, but other issues would likely arise, including the denuclearisation of North Korea. 'I repeat: The government is open to talking with North Korea, regardless of time, location and form,' Cho said. Should the talks be held, it would be the first such dialogue since a vice-ministerial meeting in December 2015. South Korean President Moon Jae-in welcomed Kim's New Year address and asked his government to move as quickly as possible to bring North Korea to the Olympics, but he stressed that an improvement in inter-Korean relations 'cannot go separately with resolving North Korea's nuclear programme'. China, which has persistently urged a return to talks to ease tensions, said recent positive comments from North and South Korea were a good thing. 'China welcomes and supports North Korea and South Korea taking earnest efforts to treat this as an opportunity to improve mutual relations, promote the alleviation of the situation on the Korean peninsula and realize denuclearisation on the peninsula,' Foreign Ministry spokesman Geng Shuang said.